Drinking chocolate has a rich and vast history. It is a heated beverage and consists of shaved chocolate, melted chocolate or cocoa powder. It is created with heated milk or water and sugar & cream are also often added. The first drinking chocolate beverage is believed to have been created by the Mayans around 2000 years ago with a cocoa beverage being an essential part of Aztex culture by 1400 AD. Cacao had immense symbolic value with cacao beans being amongst the most valuable commodities and could be used as a form of payment. Utilized as a rare luxury for the Aztecs, Xocolātl or “bitter water” was the beverage of warriors and nobles. Used as a potent intoxicant and something that was drunk with great solemnity and seriousness. It was described as something “not drunk unthinkingly”. 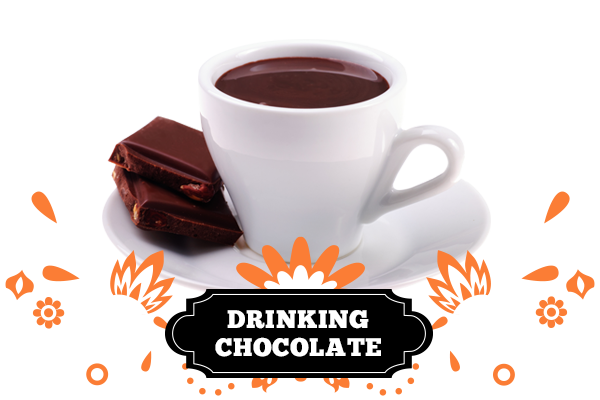 Drinking chocolate was prepared in a huge variety of ways and most of them involved mixing hot water with toasted and ground cacao beans, maize and any number of flavourers such as chilli, honey, vanilla and a variety of spices. The ingredients were mixed and beaten with a beating stick or aerated by pouring the chocolate from one vessel to another. If the cacao was of high quality, this produced a rich head of foam. Mexico introduced drinking chocolate to the New World, and soon became a popular beverage in Europe. It has been adopted by most cultures, and has almost as many variations. Until the 19th century drinking chocolate was used for medicinal purposes, treating ailments such as liver and stomach diseases. The early chocolate beverages were not the sweet drinks we know today as they were more bitter, often had spices added, and were often served cold. You can achieve a true indulgence at home with authentic drinking chocolate crafted with real chocolate to give you a rich beverage any time of the day or night.